Mega Sleek Shampoo is rated 2.6 out of 5 by 27. 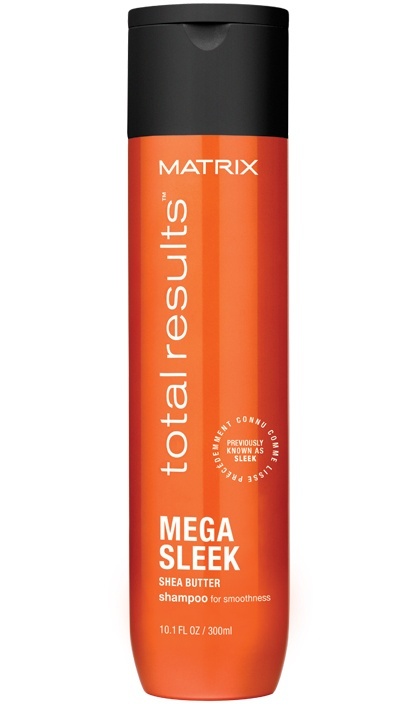 Share https://www.matrix.com/total-results/products/mega-sleek/mega-sleek-shampoo Mega Sleek Shampoohttps://www.matrix.com/~/media/matrix us media library/2017jan/2017trrefresh/tr_sleek_shampoo_300_seal_wt_420x708.jpg Cleanses to help control rebellious, unruly hair and manages frizz against humidity. Cleanses to help control rebellious, unruly hair and manages frizz against humidity. Mega Sleek Shampoo with smoothing shea butter helps control rebellious, unruly hair and manages frizz against humidity for smoothness. Hair is smooth, shiny and defrizzed. To use: Apply to damp hair. Lather. Rinse. Follow with Mega Sleek Conditioner. In case of contact with eyes, rinse them immediately. Rated 5 out of 5 by Unruleyhair from Best shampoo I’ve ever used! Just got this shampoo and conditioner, not only does it make my hair amazingly manageable, but it smells amazing. Everyone should use this product! Rated 2 out of 5 by Adeleo from Not a fan of the smell I purchased this in a multipack deal so didn’t smell it before buying and it smells like pine scented toilet cleaner! Surely it’s not hard to make a shampoo smell nice. I’m not happy to be smelling like a toilet until I finish the bottle. Rated 5 out of 5 by jentothewren from Fantastic results - not coloured hair My sister in law (hair dresser) gave me this for my Christmas present and the compliments I have been getting at work have been amazing. My hair is straight and not frizzy but it has really brought out shin and colour. It looks like She said this was suitable as I didn't colour my hair. Rated 1 out of 5 by catgeo86 from Not What it used to be! I have used Matrix Sleek for 15 years with incredible results. Since the "new packaging" which I feel HAS to be a formula change, my hair is breaking, dry, falling out, and limp and lifeless. My hair has really just deteriorated it's absolutely terrible! Rated 1 out of 5 by nikiacosta from I couldn't figure it out!!! I have been wondering what happened to my shiny sleek hair given that nothing else has changed. It's the new formula. I know that now, because I'm not the only one! So what changed? I'd gladly pay more for the old stuff. What smoothing ingredients have been removed from the new formula so I can look for something that has whatever you used to put in the old formula? Rated 5 out of 5 by MJ01 from The best shampoo of all time! This is the only shampoo that doesn't dry out my hair, and it is amazing! The shampoo and conditioner together compliment each other very well! I have been using it for years, and it will forever be my favorite. Rated 1 out of 5 by Ratsnest from Mega Sleek I have used Matrix Sleek Shampoo for years. Awesome results . I found my shop ko store no longer had this on shelves so purchased Mega sleek thinking you had changed bottle design. OMG for months I have wondered what has happened to my hair. Purchased new pillows. Cut hair thinking my hair was weak. Ripping my hair out every morning trying to even get my fingers this snarly mess. Thought I would get on line to see if I could get old product just in case this was the problem. found this sight. Yes others having the same results. I don"t have to continue this nightmare.